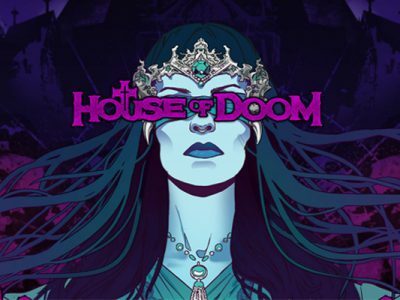 The House of Doom slot takes you to some dark corners of planet earth. You’ll love playing this Play’n GO gem if you’re a bit of a thrill seeker and need to escape everyday’s mundane existence for a little while. This slot has a pretty basic set-up even though it comes with an extraordinary theme. It has 5 reels and 10 paylines. The design is where this game really stands out, both the background theme and sounds fit perfectly in this dark slot. The soundtrack you hear while playing was developed by Play’N Go in collaboration with the Candlemass band for the optimal result. Even though this slot is quite easy to understand, you might want to try it out for free at one of the selected online casinos. 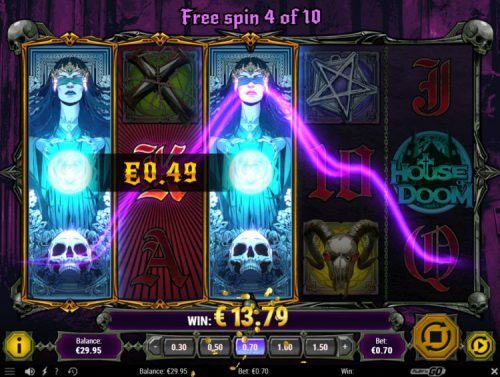 All the symbols on this slot are full-fledged dark gothic style as you’d expect. This slot has both standard and game specific symbols. There are different features and bonus games to look out for. Let’s start with Hellgate, this is where a reel will get selected and randomly highlighted. If you’re lucky, this can help you generate a win easily because it has the capability to replace all other symbols on the reel. Additionally the House of Doom has so called Doom spins. This is an exciting round of spins, up to 10. While this feature is active, the scatter will act as a wild. That means it can substitute for all symbols. Last but not least, there are skulls of abyss. If you get 3 of these, you’ll automatically roll into the bonus game. What happens next is that a total of 15 skulls appear on the reels and it’s up to you to choose one which then will reveal a prize. Play’N Go: the master of great storylines in slots and amazing graphics. Even though House of Doom isn’t their graphic masterpiece, it’s quite simple actually, it nevertheless is very pleasant to look at and to play. Their software is always flawlessly engineered, a good reason to understand Play’N Go’s immense growing popularity in the online casino business over the past few years. So the question here is: what makes them so great that you can’t ignore the amazingness of their games? It’s the attention to detail. Players love it. This is not a progressive slot but it has a jackpot of 10. Bets start at a minimum coin size of 0.01 to a maximum of 10. This allows the players a wide range of choice in regards to bets. Before you place your bets you should do two things. The first one is adjust the coin value. The second is turn up the volume on your speakers because you don’t want to miss out on the tunes of this slot!